Some game mods are practical in nature: They add features, boost performance, or restore content that was cut prior to release. The GTA5 Reaper mod is not one of those. It's better. 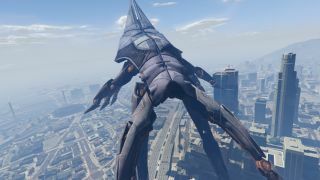 Unfortunately, it's not a real Reaper, which is to say that it can't turn the city of Los Santos into a smoldering pile of rubble. Mod creator JJxOracle explains that it "replaces the blimp," but in reality, as this video (via GamesRadar) makes clear at around the 2:45 mark, it's still there, stuffed inside a big, floating space-lobster shell. The Reaper skin will sometimes disappear, he said, and collision detection still needs to be added, but he's still working on it. And even just as it is, it looks fantastic. Enjoy!